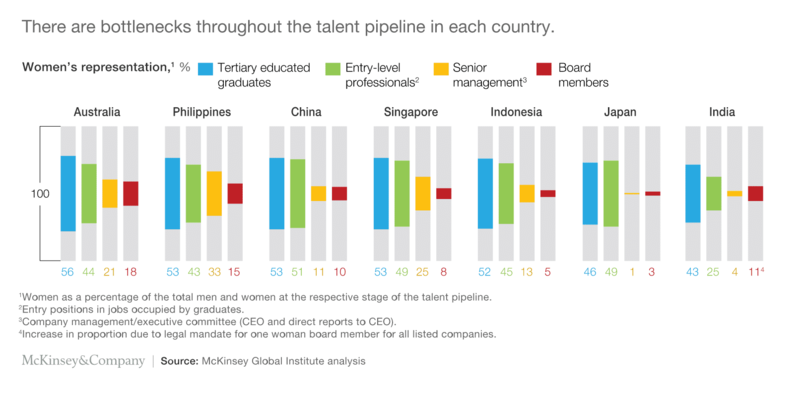 McKinsey’s new report The power of parity: Advancing women’s equality in Asia Pacific argues that advancing women’s equality in the countries of Asia Pacific could add $4.5 trillion to their collective annual GDP in 2025, a 12 percent increase over the business-as-usual trajectory. The research examines Asia Pacific as a whole with a particular focus on seven countries: Australia, China, India, Indonesia, Japan, the Philippines, and Singapore. On gender equality in work, the Philippines stands out for its progress, followed by New Zealand and Singapore. The six countries furthest from gender parity in work are Bangladesh, India, Japan, Nepal, Pakistan, and South Korea. China does well on female labor-force participation but can improve its share of women in leadership—as can most countries in Asia. The smaller share of women in company leadership isn’t all about the glass ceiling. The relative lack of women in the top positions in business has its roots far earlier in the talent pipeline that runs from enrollment in tertiary education to entry-level positions, middle management, and the boardroom. The share of women erodes the further they are along this pipeline, with different patterns and bottlenecks among countries. Women’s representation on boards in Asia Pacific is low compared with the average share in advanced economies of 28 percent. The largest barrier to women moving into senior roles cited by executives surveyed by McKinsey—45 percent—was the “anytime, anywhere” performance model. The second biggest—cited by 32 percent of respondents—was the “double burden” of women holding down a job while looking after their families, particularly in societies where women are still expected to take sole responsibility for family and household duties. Third was an absence of female role models, followed by a lack of pro-family public policies and support, including childcare; 30 percent of respondents cited the latter factor. Having trouble engaging men in gender equality? Try these tips.